Ultra-endurance sporting events like LOTOJA requires great overall fitness, incredible endurance, the right food, rest and a number of other important factors. Undoubtedly, most of our efforts are geared towards speed, endurance and traveling faster. One of the more neglected areas of fitness is our core strength. From a cyclists perspective, core strength should be near the top of your list of strength focus areas. With a strong core we can alleviate back pain, enjoy greater power transfer, endurance and comfort. All this adds up to a better more enjoyable ride to the finish. Back Pain: Ouch. Back pain is the nemesis of a great bike ride. This pain can be found in all areas of the back. From the lower back all the way up to your shoulders. It will slow you down. Cause you to drop off the back and even quit early. Power Transfer: It's true. If your upper body has a weak core, much of your power can be lost during each pedal stroke. You'll spend a ton of energy rocking back and forth and bouncing up and down. With a strong core, you'll be solid making every pedal stroke efficient and adding a little more power. Many of the best sprinters in the world make core strength a priority to eek out every bit of power and speed. Endurance: If ultra-endurance events are for you, core strength will enhance your ability to endure longer. Comfort: Nothing is better than completing events like LOTOJA and still feeling good (well, relatively). Comfort is paramount with any event. Core strength is can help you achieve comfort with minimal aches and pains. What are Core Strength Exercises? There's a number of different ways to enhance your core strength. Do whatever works well for, but I'll share with you my two favorites. This is a very easy exercise. 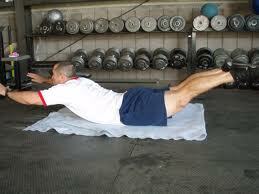 Simply lay down flat on your stomach lifting your arms above the floor. Kick it up another level by lifting your arms and legs at the same time. Hold for 10-20 seconds and repeat until it hurts too much. Sit Ups: There are many different types of sit-ups. Crunches, vertical leg crunch, and reverse crunches. All are incredible and very helpful for the reasons above. I won't offer a number of how many core exercises you should do. I would say that a near daily effort is required for a strong core. I prefer to do the Superman and Sit Ups until I can't do them much anymore. Using weights to enhance your efforts as you gain strength is recommended. How often do you work on your core strength?